Bro, does your rig even lift? I'm a 2D and 3D french motion designer, and I've designed an installation for music live shows (click here to watch the 3D preview), and now I want to build it for real. I'm aware that's not a professional setup, in a way that I don't use DMX driver (like ENTTEC stuff), but for a first try I don't have that much money to invest. Speaking of money, before buying all these things, I wanted to ask you if this setup seemed good to you. 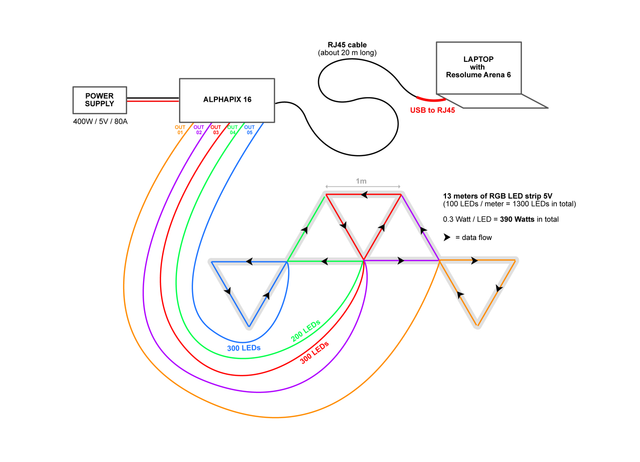 - Is a 20 meters RJ45's cable not too long to send datas ? - In this video, the man says each outpout of the AlphaPix 16 can only control 166 independent leds, while in the official web page of the product they say up to 340 pixels per outpout. Who is right ? Where the 166's number comes from ? - Is my calculation correct for the power supply ? I would be very grateful if you could help me with that. 1: Your calculation for the power supply is right. But you are 10 Watt under the max power out. I would recommend a stronger one. 2: The 20m of the Cat cable is no problem. 3: One DMX Universe is 512 Channels. Every LED needs 3 Channels (one for every color). 512/3=170,6 -> Every universe can handle 170 LED. If I understand the specs of the AlphaPix right, then it can handle 2 universe per output. -> That means 340 pixel per output and 5440 max per controller. I'd move your controller and psu as close to the setup as possible. 5v will experience a lot of line loss and will cause off colors and poor response. Also consider not pushing all the amperage through the controller and doing a multifeed approach. Wants to marry Resolume, and Resolume said "yes!" 170 Pixel...Just if you go with LED Strips with multiple LED / Pixel.